If I had my choice, these are the papers and events that I would attend at the upcoming Deign Automation Conference (DAC). 7pm – Come hear the 24th annual update on the state of EDA by Gary Smith. Moderator: Karen Bartleson from Synopsys, Inc.
Moderator: Jim Hogan from Tela Innovation, Inc.
1:30pm – Can EDA Combat the Rise of Electronic Counterfeiting? 2pm – Stephen Maneatis of True Circuits will undoubtedly highlight trends in low node PLL and DLL IP, a critical element in all ICs. 3:30pm Cadence’s Susan Peterson will address the audience on verification IP. You’ll probably want to catch the prior Synopsys presentation, too. 4:30pm – Pavilion Panel: Hardware-Assisted Prototyping and Verification: Make vs. Buy? Speakers: Albert Camilleri from Qualcomm, Inc.; Austin Lesea from Xilinx, Inc.; and Mike Dini from The Dini Group, Inc.
C. L. Liu talks about his first DAC experience: It was June 1982 that I had my first technical paper in the EDA area presented at the 19th Design Automation Conference. It was exactly 20 years after I completed my doctoral study and exactly 30 years ago from today. I would like to share with the audience how my prior educational experience prepared me to enter the EDA field and how my EDA experience prepared me for the other aspects of my professional life. 1:30pm – It’s the Software, Stupid! Truth or Myth? Speakers: Serge Leef from Mentor Graphics Corp.; Chris Rowen from Tensilica, Inc.; Debashis Bhattacharya from FutureWei Technologies, Inc.; Kathryn S. McKinley from Microsoft Research, Univ. of Texas; and Eli Savransky from NVIDIA Corp.
3:30pm – Parallelization and Software Development: Hope, Hype, or Horror? Chair: Farinaz Koushanfar from Rice Univ. This paper proposes using hardware description languages (HDLs) for PC board schematic entry. Doing so provides benefits already known to ASIC and FPGA designers including the ability to design using standard and open languages, the ability to edit designs using familiar text editors, the availability source code control systems for collaboration and the tracking and managing of design changes, and the use of IDE’s to help in the design entry process. This talk will introduce PHDL – an HDL specifically developed for doing PC board design capture and describe examples of its initial use for PC board designs. Speakers from Brigham Young Univ. Nowadays variation-aware IC designs require many thousands or even millions of repeated SPICE simulations for relatively small nonlinear circuits. In this work, we present a massively parallel SPICE simulator on GPU, TinySPICE, for efficiently analyzing small nonlinear circuits, such as standard cell designs, SRAMs, etc. Our GPU implementation allows for a large number of small circuit simulations in GPU’s shared memory that involve novel circuit linearization and matrix solution techniques, and eliminates most of the GPU device memory accesses during the Newton-Raphson iterations, which thereby enables extremely high-throughput SPICE simulations on GPU. Compared with CPU-based SPICE simulations, TinySPICE achieves up to 264X speedups for SRAM yield analysis without loss of accuracy. Print content continues its steady decline in our everyday lives. But what is the real impact on semiconductor IP designs? Few semiconductor IP designers use print exclusively for the development of their System-on-Chips (SoC). But print still plays some role a part in the creation of complex chips. But for how much longer? Shifting sands: Trends in embedded systems design – EETimes’s David Blaza puts a good face on the demise of the print version of Embedded.com But is it really a print vs. online question or an “general” embedded vs. “specific” embedded-application issue? The answer has implication for all general embedded pubs and conferences. What lies ahead for science and science writing? – 10th anniversary of MIT Graduate Program in Science Writing celebrates past, looks to future. Multimedia E-books: Immersive or Subversive? – Here’s a different perspective on the demise of print. Will those of us practiced in the art of text content even survive? What role does print play in the design of your SoCs? Drop me a quick line to let me know! Recent data suggests the value and shortcomings of design data management (DDM) and project lifecycle management (PLM) tools to improve IP reuse. Last time, I focused on the potential long revenue tail of chip design afforded by the extraction, packaging and selling of semiconductor IP. IPextreme is one example of a company that enables the extraction, package and creation of licensable IP products. Websites like the GSA portal, IPestimate’s Constellation platform and Chipestimate.com can help with the distribution and potential sales – among other things. Yet all of these companies with the exception of Chipestimate.com live outside the realm of the chip development process. Chipestimate.com provides estimation tools like InCyte Chip Estimator and Cadence Chip Planning System (CCPS) that allow designers to make IP tradeoffs in terms of power, performance and even cost. But who can help manage the actual process of chip design? Let’s return to our level of abstraction of the chip design and semiconductor IP creation. 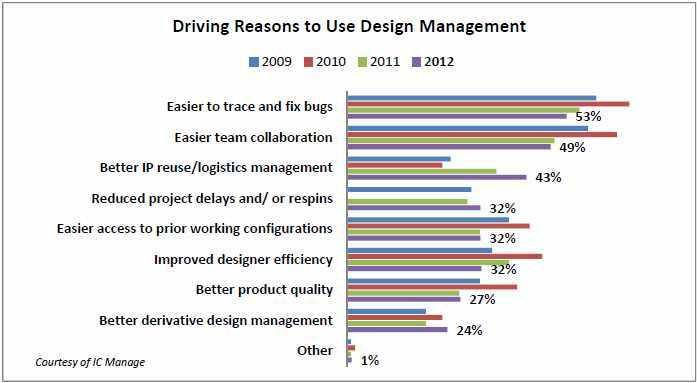 A recent study found that one of the top factors driving the use of chip-level design management systems is “IP Reuse/Logistics Management (43%).” This data comes from the annual Global Design Management report sponsored by ICManage. Further, the year-over-year data suggests that improved IP reuse and logistics management continue to be illusive goals for most SoC developers. The report also found shortcomings in existing tool offerings by noting that the most critical feature for IP reuse/logistics management is bug notification and tracing (50 %), followed closely by integrating and assembling the IP in the design (48%) and efficiently making internal IP available for reuse (47%). Regardless of the shortcomings, any tools that can help manage the growing complexity of the chip design and IP reuse processes are welcomed in our industry. Collaboration Penalty Is Steep For Engineers - System-Level Design sat down to discuss chip-design productivity and quality issues with Srinath Anantharaman, president and founder of Cliosoft; Ronald Collett, president and CEO of Numetrics Management Systems; and Michel Tabusse, CEO and co-founder of Satin Technologies. The IP Blame Game - The topic of IP quality in the SoC era is difficult to define, and solutions to problems relating to IP quality, verification, and use are hard to find. Debates rage between IP users, suppliers, and EDA vendors about where the responsibility lies for making quality IP available for use and re-use in an efficient, predictable, and scalable manner. EDA Extends Board Design into Manufacturing - A recent EDA and PCB acquisition represents a significant merger between the worlds of electronic and mechanical manufacturing. While not the primary theme at this year’s Globalpress eSummit 2012, low power concerns were present in almost every presentation as these snippets reveal. HardCopy (structured ASIC product) can further reduce power as compared to FPGAs by hardwiring a good portion of the chip. For reference, a chip company needs 30 million units at $10 per unit for an ASIC implementation to make sense. For mobile phone designs, the voice requirements are outpacing bothMoore’s Law and battery technology. Designers will need to innovate more than just ride the wave of silicon technology (Moore’s Law). Mobile phones need increasing lower power matched with higher performance. Unfortunately, battery technology only improves by a couple percent per year. The host CPU in a smart phone can not keep up with audio requirements. Power is critical. ARM cortex process is a great CPU, but not a great DSP. There is a big gap in performance – 15x between running audio codec on optimized DSP verses a general CPU. A recent FCC report blames Google’s software development process for its WiFi privacy breach. How stable is the process for semiconductor IP creation? This is simply shocking! How could these horrendous missteps have happened? Perhaps to meet deadlines, improve product performances or the morale of the developers? Certainly these shortcomings never happen at other software development companies! After all, what manager would approve changing the code to improve performance? (Answer: Almost any.) Or what engineer or manager wouldn’t enjoy meeting with legal beagles to explain any technical issue? (Answer: Almost all.) And what manager hasn’t pre-approved some paperwork to get a project going or back on track? (Answer: The great majority.) In case of documentation, the FCC report doesn’t indicate if the document was a software specification, user guide or product brochure. My somewhat sarcastic point is that all of these shortcomings in Google’s software development process are common practices – sometimes even best practices. Anyone who has led a team of software developers in the real world – as I have – can attest to the occasional transgression to meet deadlines, stay on budget, improve the product or just get the job done. Even the most serious allegation in the FCC report seems inconclusive. The search company originally blamed the privacy breach on a lone engineer who intended to write software to collect WiFi network data, not personal information. The validity of that claim should be easy enough to discern by looking at the code. 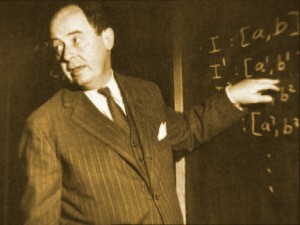 A peer review of the software would quickly confirm the developer’s guilt or innocence. Blaming the software development process is a tried-and-true way to divert responsibility from management. Neither the FCC report nor Google’s responses provide much insight. One is tempted to ask how Google measures the maturity of their internal software process. Do they use a standard Capability Maturity Model Integration (CMMI) approach or something similar? Searching Google for the answer is frustrating at best. Try it. Characteristics of the Capability Maturity Model "best practices" for software development. Some readers may wonder what all of this has to do with semiconductor IP development. Software development challenges are headaches faced by all engineers, programmers and managers – from applications and middleware down through firmware and even – gasp! – chip specific RTL. Have you ever wonder if a method exists to evaluate the software development process of semiconductor IP? Not the verification of IP functionality, but the validation of the development process itself? Warren Savage, CEO of IP-Extreme, shared insights into this question and others during an interview at the recent GlobalPress eSummit. Look for Savage’s comments in my next blog. You are currently browsing the JB's Circuit blog archives for May, 2012.